Where are the best areas for some great river bass fishing? What lures and type of tackle should be used? How should those key hot spots be fished? Well, as we all know, rivers have swift moving waters and curvy bends throughout their systems. And as bass fishermen know, it can be a little difficult sometimes to maintain boat position in fast moving currents, let alone getting bass to strike. But actually, fish like to hang out in most rivers, and the bass tend to feed a bit more aggressively in higher oxygenated waters. Therefore, getting to the best spots and using the right tackle and presentations, your chances for successfully catching more largemouth bass should greatly increase. We've put together the top five fishing spots to locate largemouth bass in rivers throughout any time of the year, especially during the summer, along with helpful tips and tactics to use. Good luck freshwater fishing. Depending on the river, some rivers have tons of weeds and grassy structure, while other river systems have a scarce amount of foliage. For instance, much of the rivers running throughout the California Delta have tons of weed beds continuously scattered everywhere. However, some rivers across the globe may only contain just a handful. Just like most types of plant life, the vegetation sprouts up in the spring. However, in the faster moving currents of water, the new growth tends to get uprooted and carried away down stream. When you do come across those patches of weed beds, stop and attack it. During the summer months, bait fish will usually be concentrated there. And rest assure, where there's bait fish, there should often be bigger predator fish lurking around. It's like an all you can eat buffet for bass, which is one reason why weed beds rank number one for river bass fishing summer time hot spots. A heavy monofilament fishing line can be matched up for tossing poppers and spooks. And about a 30 pound test braided fishing line should do the trick for topwater frogs. For lily pads and thick matted grassy vegetation, try a 1/4 ounce bullet weight rigged weedless Texas rig style with a 7 inch Power Worm, or other plastic creature baits such as lizards, brush hogs, wooly beavers or crayfish replicas. During dusk, dawn, or overcast skies of low light conditions, work your topwater lures such as pencil poppers, walking plugs and weedless frogs. When the sun is up, begin tossing, flipping and pitching your favorite soft plastic baits across the top of the weedy cover. 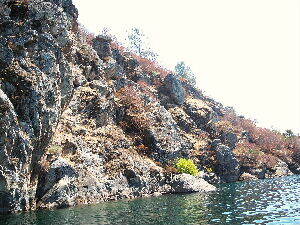 Coming in at number 2 for river bass fishing hot spots are creek mouths, along the ledges of the points. When water temperatures begin to increase and become "too hot to trot" for the fish to remain comfortable, the largemouth bass move to shallower water. These shallow spots will often be just off the first ledge at the mouth of creeks, along the flats of the extended points leading into the main river system. A vertical diving type of crankbait, such as the Rapala DT (Dives-To) series lures, should be a great choice. A lipless crankbait like Rat-L-Traps may also be decent consideration. Tie your favorite crankbait onto 10-12 pound test flourocarbon fishing line to achieve the desired results. 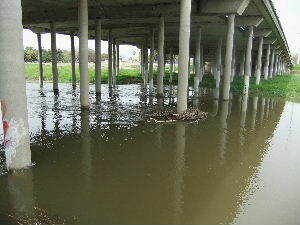 Keep in mind that those largemouth bass in rivers tend to hug along the bottom near structure. And just as predatory fish like these bucketmouths do, they face upstream waiting to ambush and feed on bait fish and other resources of food flowing downstream. Toss your crankbaits out in front of the fish and crank the lures toward them. Be sure that your crankbait is continuously in contact along the bottom, rather than fishing it above their heads. Rated number 3 for river bass fishing, docks are among every bass anglers favorite spots. Boat docks and walking piers are sweet hot spots for holding fish. They provide shade and a significant amount of cover for bass. You'll usually find plenty of bass hanging around docks, but they can sometimes play hard to get. And they may not always be big mama bucketmouths, unless the scenario is right. The more structure like brush piles, laydowns or rocks around those docks, the more likely that the bigger bass will be there too. Topwater plugs like poppers and walking baits for low light conditions, and soft plastics and jigs for any other situation. Topwater Lures: Try 15 pound test monofilament fishing line. Subsurface Lures: Try 17 pound test flourocarbon fishing line. As always, the lighter the better. But the more structure and the more likely to get hung up or snagged, then the heavier you might want to go, especially fishing for largemouth bass in rivers where there may be faster moving currents of water flow. You can plug away with your topwater lures near and around the edges of the docks and piers during dusk, dawn and overcast skies. Flip and pitch your jigs, plastic worms and creature baits under and around the docks and surrounding pilings and obtrusive structure. Tip: Be sure to continuously check your fishing line for frays, especially after dragging those hard nosed largemouth bass out from around the wood pilings. The go-to lures for fishing around bridges would be crankbaits, matched up with 10 to 12 pound test fluorocarbon fishing line. Soft plastic baits like curly tail Power Bait Worms can be rigged Texas style, or finesse worms on a drop shot are great choices to mop up and entice those finicky bass. Run you crankbaits along the edges of the bridge pilings and braces. Generally, the flow of the current will help aide the crankbait into the inside cavities of the structure, which creates an additional clacking sound while knocking off the cement walls, thus attracting fish towards the noise and eventually enticing them to strike. You can follow up by fishing with soft plastics, and to get down to the deeper areas of the water column around those bridge pilings and the ledges extending out from them. 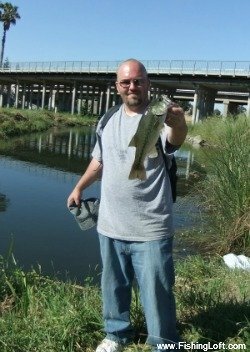 Freshwater fishing surprise: Check out one of my largemouth bass fishing adventures where I actually caught a striped bass under a bridge by pure surprise in an area of a river where they aren't normally expected to be found. Follow the link for the striper fishing story. Riprap, boulders, rock structures and cemented wall barriers provide warmth from the sun's heat bearing down on them throughout the day. Largemouth bass are able to find cover within crevices and abnormal rocky structure while having a vantage ambush point to attack their prey. Crayfish enjoy hanging out here in the rocks too. Topwater lures like buzzbaits and poppers fair well in low light conditions. Crankbaits matching the colors of bait fish and replicas of crayfish, rigged with 8 to 12 pound test fluorocarbon fishing line. Fish topwater baits if and when the cloud cover pushes to blanket the sun, and right around the evening hours of dawn. Use crankbaits all day while ensuring they knock and bump through the rocks. Spinnerbaits, chatterbaits and jigs rolled across the rocks may also be great producers. Cast us a line and tell us about your largemouth bass fishing. As a matter of fact, you can share your largemouth bass fishing pictures here.